It is sad and unfortunate how cheap life has become in our world. The most recent tragedy in Bangaldesh on 24th April when a factory building collapsed near Dhaka, where more than 273 poor labourers died. It is reported that hundred of workers are still missing under the debris. The rescue operation is still under way to help out people. Countless injured have already overwhelmed local hospitals. According to the reports, the owner of the company was warned about the dilapidated conditions of the building but in spite of being made aware of the situation, he kept on scapegoating the poor men, children and women who later became the victims of his negligence, indifference and careless attitude which is a common and sad trait among many employers who are keen on running their billion dollar business at the cost of poor man’s lives. Many a times such employers do not come under any legal binding when calamities like Dhaka hit them. They slither away by playing blame games. The Government should ensure safety to the lives of poor workers who eke out their living in extreme conditions to avoid any such future tragedy. The sheer divide between poor and rich is obvious in societies like Bangladesh where strict measures are not taken to ensure health and safety issues. When life of a poor is taken doubled time cheaper than the rich. It would be interesting to find out how is the owner punished who is said to be in hiding. 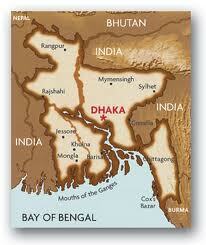 Bangladesh has one of the most biggest clothing industry in the world. Unfortunately, employers who roll out in money provide very little compensation. The poor is crushed while rich feasts upon their poverty. Many such like clothing factories supply their clothes to many western giant retail companies. How would you feel if you are wearing a trouser or shirt made by some of these labourers who later became victims of such neglect ? This entry was posted in Asia, Social Articles and tagged Christian, Injustice, International News, Shekinah, South asia, World News. Bookmark the permalink.